George Rodrigue, known worldwide for his Blue Dog canvases, began painting in 1968 not bright-colored dogs but near-black trees. 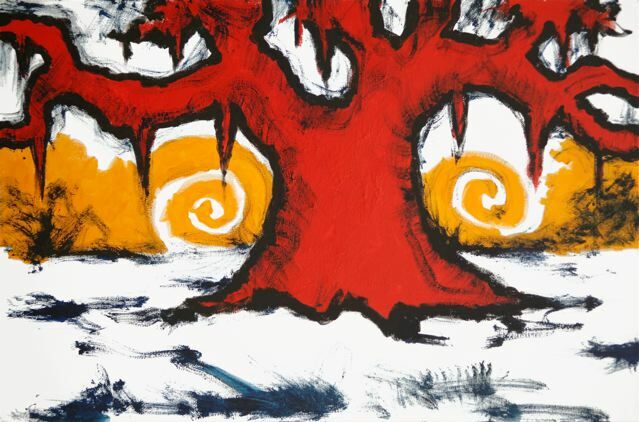 His devotion to the Louisiana landscape remains an anchor within his art throughout forty-five years of Cajuns, Portraits and Blue Dogs, most of which include the now recognized Rodrigue Oak. His landscapes today, although rooted in those early dark canvases, reveal a mature artist, confident in his craft. Some include the familiar deep greens and browns; however none are so dark as his earliest works. And some paintings essentially interchange his subjects, so that the strong design and color of a tree might as well be that of a dog. 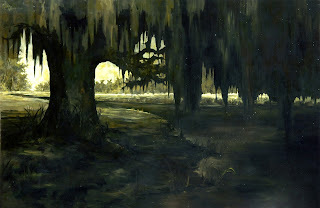 Such is the case with Rodrigue’s Acrylic Landscapes. I’ve written often, especially this summer, about Rodrigue’s lifesaving, yet challenging shift from oil to acrylic paint, a change he made permanent in the early 1990s. The Blue Dog works well in the fast-drying intense acrylic colors. However, Rodrigue’s Landscapes pose a greater challenge without the ability to blend the pigment in his established painterly style. 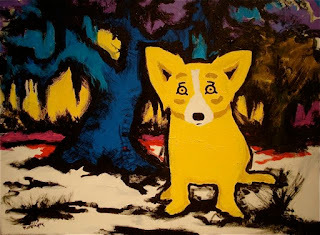 His use of acrylic paint forced Rodrigue in new directions within his art. 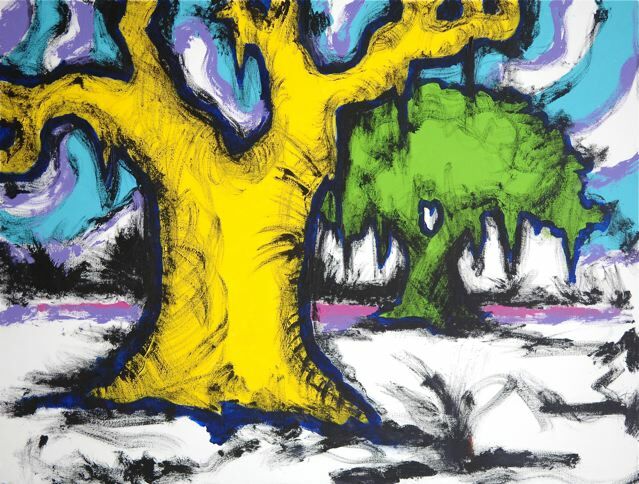 Even though the latest water-based oil paints allow him today a revisit of his early style, such as in the recent painting below, his years with acrylic paint and the hundreds of canvases since his first oak trees result in paintings affected by the knowledge and confidence of his age and experience, as well as a palette now firmly devoted to color. In his landscapes, no matter what the year, Rodrigue adheres to the basic rules he established for himself in the late 1960s. Rejecting the spacious sky of traditional European-style paintings, he pushes a large oak to the front of his canvas, cropping the top of the tree so that the light shines in the distance and from beneath the branches. With its hard edge and strong shape, his oak stands like a symbol of both his state and culture. In addition, he rejects specific locales, painting the Louisiana in his head as opposed to the one outside. In this way his paintings, no matter what the year or series, express a sense of mystery regarding time, place and, above all, meaning. His challenge lies in working within these self-imposed parameters while developing his style. This is most obvious within the Acrylic Landscapes, where the basic rules apply, yet the paintings communicate a contemporary statement akin to Rodrigue’s Blue Dog canvases. He achieves this not only through his use of color, but also by adopting a sketch-like treatment using heavy, unblended pigment and large, loose brushstrokes. Because George is successful, it’s difficult sometimes for the rest of us to understand that he still experiments and grows within his art. He returns to his Oak Tree repeatedly; however, like his long journey with the Blue Dog, his approach remains bound by his own evolution and interests. “If it doesn’t make me happy, then I don’t paint it,” he says often. It is this mindset that allows him to break with a certain style of painting without fearing the public’s reaction. …as he painted his first few Acrylic Landscapes, now a series of forty paintings, some with the Blue Dog and some without. Yet George Rodrigue’s comment was not a lament or regret, but merely an observation, as he continues exploring with freedom, both within his mind and on his canvas. Watching George paint in videos with acrylics is magical. I wonder what it would be like to watch him paint with oils. But for the sake of his breaking his mother's longevity record, I don't want to find out! I can tell you exactly how it is watching George paint with oils --- SLOW, lasting weeks or sometimes months. Actually, the acrylics are slow too, at least slower than the demos within the videos. He paints very quickly with large brushes and straight from the tube for public demonstrations so that his audience remains interested. Afterwards, he completely repaints the work over a week or so in his studio. And I agree with you, Patty....it is "magical" watching him paint, and I often remind myself how lucky I am to witness some stage of every canvas. Thanks so much for your comments, as always! I wonder what it is about real locations that turns Mr. Rodgrigue off so much. He didn't have a problem painting specific people and it's not as though he had to paint the same three locations of New Orleans over and over that so many of us have to, to survive. It reminds me of Bob Ross, we know that it's a happy tree in Colorado but it only exists in his head. I believed he explained it by wanting to be like a god, creating a world of his own creation. I never agreed with that though because it's not really of his own creation, it's still inspired from an actual place. Even fantasy world art is still inspired from our senses on earth. Because this way, Robert, he takes Louisiana with him and paints it anywhere (for the past 20 years, nearly every canvas, in fact, in California). George would never be so bold as to link his creative process with a god complex, and of course he's deeply inspired by "our senses on earth," and would never describe his work as "fantasy," although he does link it to mystery. As to the people, yes, they are specific. However, he stages their photographs in a room and then cuts them out of the photograph, designing his landscape around them within his paintings. As the post describes, his paintings are full of symbolism and his own rules -- the very rules that link his paintings. His real passion, even before Louisiana, is color, design, and shape. These he constructs in his head. In the end, he doesn't see a landscape (or for that matter, a dog) in his paintings at all. As he's described it to me, the canvas is its own world. Once he's solved the pieces, lines, and pigment, the painting is finished. You prefer one way of working, and he prefers another. It's as simple as that. Neither one is right or wrong. I'm certainly bold enough to link painting, creating anything that's greater than the sum of it's parts, to the concept of god and I don't think it's egotistical. Artists are the gods of their canvases, "the canvas is its own world." It's magic whether the source for the image is a rigid photo or almost completely from the imagination. However, the very popular abstract and/or non-representational art seems lacking to me no matter how beautiful it is to view. I have a hard time seeing it other than a decoration. Mr. Rodgrigue does have me mystified. His dog isn't a dog. I can understand looking at the painting from a design perspective, even more from a materialistic point of view: how the paint actually sits upon the canvas and dances beside each other. I understand metaphor and the dog symbolism his self, as I believe I heard him once describe. But I really don't understand the dog being nothing but shape and color. This is not a sentence, just the illusion of one. I hope I didn't imply that I thought his way was wrong. Although it's obvious that I'm at the other end of a spectrum. As I was breaking from linking my paintings to the gps coordinates of google maps I read, "In addition, he rejects specific locales, painting the Louisiana in his head as opposed to the one outside. In this way his paintings, no matter what the year or series, express a sense of mystery regarding time, place and, above all, meaning." You're song did sing to me even if it wasn't about me. I miss the mystery because his landscapes look specifically like Louisiana. I'm sure most people don't care about GPS. And indeed you do mention the "metaphor." My apologies. If you see a dog in his paintings, he's fine with that too. His only real concern is the sincerity of his expression and the success of his personal experience, both of which matter only to him and are separate from and irrelevant of the viewer's analysis. In other words, I'm describing his experience alone, not what he thinks yours should be. Your paintings are the best. The creepy themes that you try to impart in your painting are really interesting. Its amazing how acrylic paint can give this vibe. Anhe utmost pleasure; I am firmly convinced that George Rodrigue is a art critic I am not, nor even knowledgeable enough to call myself an afficianado; however, the pleasure and meaning that Mr. Rodrigue expresses in his work and that you relate in your writings, Wendy, are clearly apparent to those of us who follow his art and your blog with the utmost pleasure. I am firmly convinced that George Rodrigue is an enduring icon of (especially) Louisiana, and, indeed, the entire art world and history. Love the colorful new oaks!